Major regions were identified along with countries contributing the maximum share. Secondary research was conducted to obtain the value of mechanized irrigation systems market for regions such as North America, Europe, Asia Pacific, South America, and RoW. 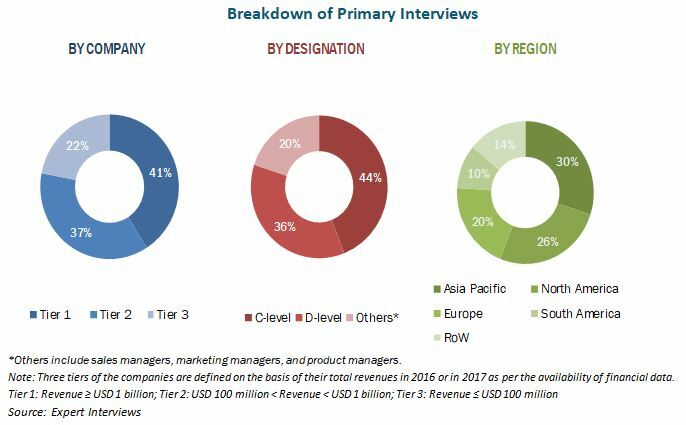 Key players have been identified through secondary sources such as the Bloomberg Businessweek, Factiva, agricultural magazines, and companies’ annual reports, while their market share in the respective regions has been determined through both, primary and secondary research. The research methodology includes the study of annual and financial reports of top market players as well as interviews with industry experts (such as CEOs, VPs, directors, and marketing executives) for key insights (both quantitative and qualitative) for the mechanized irrigation systems market. The key players profiled in this report include Lindsay Corporation (US), Valmont Industries, Inc. (US), Reinke Manufacturing Company, Inc. (US), Nelson Irrigation Corporation (US), T-L Irrigation Company (US), Jain Irrigation Systems Ltd. (India), Pierce Corporation (US), Alkhorayef Group (Saudi Arabia), Hunter Industries (US), and Rain Bird Corporation (US). This research report categorizes the mechanized irrigation systems market based on type, crop type, field size, mobility, and region. Further breakdown of the Rest of Europe mechanized irrigation systems market into the UK, Austria, Poland, and the Scandinavian region. Further breakdown of the Rest of Asia Pacific mechanized irrigation systems market into Thailand, Vietnam, and South Korea. Further breakdown of the Rest of South America mechanized irrigation systems market into Peru, Chile, and Colombia. The mechanized irrigation systems market is projected to grow at a CAGR of 14.97% from 2017, to reach a value of USD 4.27 billion by 2022. The growing requirement of irrigation facilities for agricultural production & yields and enhancing farmland values have contributed to the growth of the mechanized irrigation systems. Center pivot irrigation systems were the most dominant type segment in 2016; the market for these systems is projected to grow at the highest rate due to the adaptability of these systems to different terrains, crop type, land sizes, and weather conditions. Other systems such as micro-sprinklers are gaining popularity as garden and lawn sprinklers for the purpose of lawn maintenance. The use of mechanized irrigation systems in large fields is projected to grow at the highest rate, due to the growing trend of consolidation of small and medium-sized land holdings into large land holdings witnessed in various irrigation markets around the globe. Rapid growth in the demand for cereal crops from increasing population and use of cereals in animal feed and biofuels is also driving the application of mechanized irrigation systems in cereal crops. The acreage under the stationary mechanized irrigation systems is large, as they are the conventional irrigation systems. Also, for large acreages, the use of towable irrigation systems has not been conducive. North America accounted for the largest market share in 2016, while RoW is projected to grow at the highest CAGR for the next five years. North America extensively uses mechanized irrigation systems to maximize the production and increase the export trade. 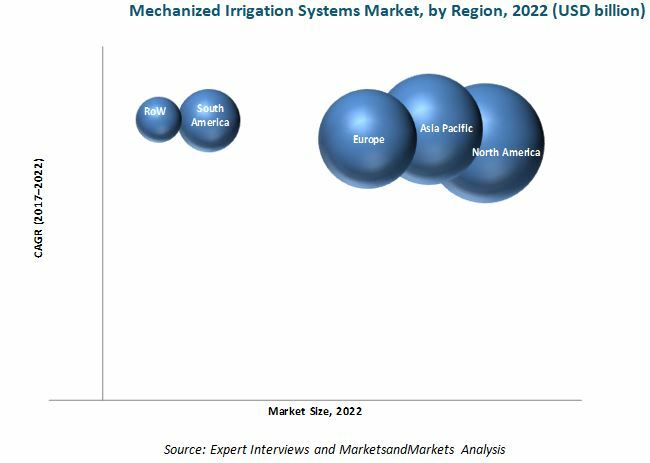 Large irrigation projects in South Africa, Saudi Arabia, and Egypt are driving the growth of mechanized irrigation systems market in RoW. For advanced irrigation systems, the capital required for the installation of these systems, particularly for sprinkler pumps is significantly higher as compared to the traditional methods of flood irrigation and rain-fed agriculture. This discourages their use by small farmers with marginal incomes. The continuous maintenance requirement further inhibits the growth of the mechanized irrigation systems market. Over the past years, competition in the mechanized irrigation market has intensified. Valmont Industries, Inc. (US), Lindsay Corporation (US), Nelson Irrigation Corporation (US), and Jain Irrigation Systems Ltd. (India) are some of the major players dominating the market. Growth in the market for mechanized irrigation systems is largely driven by strategies such as new product & technology launches, which improved the ability to monitor and control irrigation equipment. This helped achieve higher precision and uniformity in the application of water and other activities such as fertigation, germination, and chemigation. 13.4 Reinke Manufacturing Company, Inc.